It’s been awhile since I did a Frugal Friday post. Too long. It’s winter here, and this week has been wet, rainy, soggy and grey. Perfect weather for soup. My dad had given me a pumpkin from his garden, and the leeks were looking plump and juicey. Soup it was. Super basic soup that can be eaten as is or added to. I like adding natural yogurt and tomato chutney on top. Or some thai curry paste if you want a kick in the pants. The best soup is made with great vegetables. If the main ingredient is a tasteless old pumpkin…well the soup is going to taste, tasteless. Add hot water to bran, give it a minute or so to soak in and then in a mixer with a dough hook add all the ingredients and mix until comes together. Parmesan and black pepper put in amounts to your taste (or any other flavours). Knead the mixture for about 10 minutes until you have a stiff dough and then leave covered for about 45 minutes. Roll out to a couple of mm’s and cut what ever shapes you want. Place on a tray and grate extra parmesan over the top. Bake at 180C until light golden and crispy through. Shake them around a bit when you get them out of the oven to pick up any extra parmesan while they are still hot. 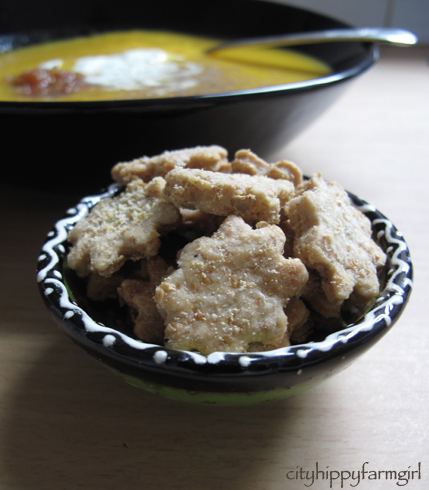 This entry was posted in Making, Creating + Frugal Living and tagged easy, food, frugal, Frugal Living, olive oil crackers, parmesan, pumpkin and leek soup, recipes by cityhippyfarmgirl. Bookmark the permalink. Love how simple it sounds. Such a beautiful shot too! Absolutely with you on the use of quality ingredients, especially when it comes to simple wholesome recipes. 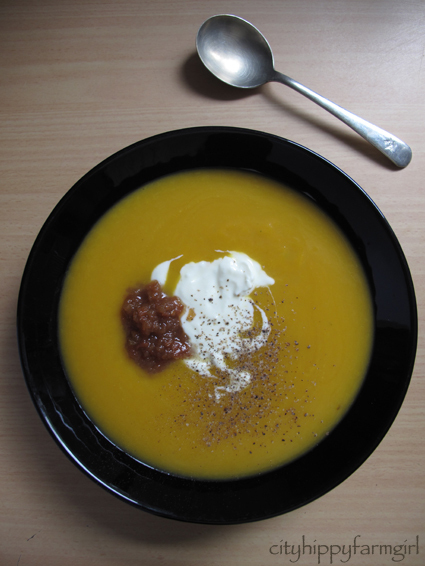 I think it’s Soup Week – I’ve had a go at a spicy sweet potato and pumpkin one but could’ve done with some of those yummy looking crackers – loved the tip of shaking up the dish to pick up the last remnants of the melted parmesan…I suspect a finger might do the same job! A small set of fingers may have done the extra- extra mopping up here too. They were pretty easy too. If they pass The Monkey test I’m happy. That’s a beautiful shot, I love it! The squiggles on your biscuit bowl and the squiggles in the soup, you are an artist with the camera and you’re making us all drool. I almost wish it was winter and I could put my slippers on and cradle a bowl of soup like that. Thanks Joanna, that’s really kind. I love winter but I’m done with it this week. Too much rain, and I can’t get anything dry. Love it. Frugal cooking at its best Jane 🙂 I’ll bet your soup tasted delicious. This looks too good to be called frugal 🙂 I also like your reminder about tasteful vegetables being required for tasty soup. It can make a huge difference. Huge difference doesn’t it. Average veges=average old soup. it’s funny, i had no idea that pumpkins need ripening for weeks after being picked. i was so excited at growing my own and tried to eat one right away. i thought i’d made some terrible mistake in the growing process and refused to eat anymore as it was truly horrific. so silly of me 😛 i like sprinkling grated cheddar cheese into circles and baking them as is to make super deliciously crunchy crispy cheese bits! Yum, I like the sounds crispy cheesy bits, I’ll have to try that. An ambitious pumpkin tried to grow in one of my pots this summer. I had such high hopes! Home made soup with home made crackers! You, my dear, are a delight! I’d order a small green salad on the side and consider this a feast! soggy out there isn’t it! Hmm, we still have leeks in the garden so I might need to give this a go when DH gets home. It looks deliious Have to try those parmesan crackers. Ginger and I are parmesan fiends:) I love that you have shaped them too. Decorative and yummy. Its summer here – and cold, wet and gloomy, so a bowl of this would go down very well! I love the colour of it and your photos are so pretty. The crackers are a winner, what a great combination of olive oil and parmesan. Thanks chutney and Spice. It’s fun getting the bowl to pose sometimes. What a super simple soup and your pretty crackers sounds great. Tell me more of this cabbage apple salad? We keep getting cabbages in the veg box, yay for seasonal but boo for so. much. cabbage. I usually do it with finely sliced chinese cabbage but normal cabbage works just fine and red as well. Just finely, finely slice it. So… cabbage, apple, grated carrot, celery, shallots, pecans or walnuts and then either a dressing of mayo or natural yogurt and a little dijon mustard. It’s my every day winter salad that I’ll quite often eat for lunch… bung in a bit of cheese too, if you want it to me more filling.